Why do you need a K-3 System? K-3™ kiosk is a self-contained Microsoft Windows data collection system that is designed specifically for those sites that require a flexible data collection terminal. It can either be mounted inside the scale house or outside on a post or pedestal near the scale. 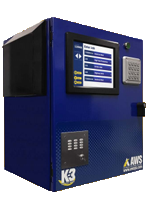 The K-3 allows drivers to process automatic transactions using the Interact® software. Database tables such as Truck, Job and Material can be updated locally with admin permissions. With an internet connection, these tables can be managed remotely with the DataSync Module.